Microsoft Internet Explorer 11 - Not recommended but supported. This is not a modern browser so performance is not optimal. Note: To simplify these instructions, only the District mobile menu is displayed. 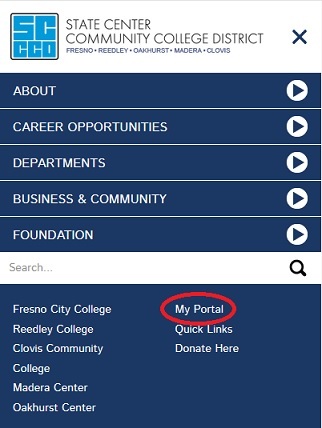 The My Portal link is located in the same location on all college websites as shown above. Logging into the portal is easy! If you run into trouble, click on the Problem Logging In link located on the login form to view support information. The tutorials listed below assume that you are already logged into the portal. Follow the directions above if you are not yet logged in. Search for classes, register, check financial aid, check grades, pay fees online, and more. Note: portlets that contain the icon are fixed and cannot be moved.